In this photo made from the footage taken from Russian Defense Ministry official web site, Russian air force personnel load bombs onto a Tu-22 bomber in preparation for a bombing mission against targets in Syria, Nov. 17, 2015. President Barack Obama said Wednesday the U.S. would welcome Russia shifting more of its efforts in Syria to confronting the Islamic State group instead of "propping up" Syrian President Bashar al-Assad. Obama called Islamic State "the principle threat," and noted that the downing of a Russian jet last month in Egypt may push President Vladimir Putin to change his focus. Islamic State militants have claimed responsibility for bombing the jet and Putin on Tuesday said his military should intensify its Syria campaign "so that the criminals realize that retribution is inevitable." Russian long-range bombers pounded the Islamic State stronghold of Raqqa in northern Syria. Pentagon spokesman Peter Cook said these strikes were the first in which Russia shared pre-flight information with U.S. commanders since the two sides agreed on flight safety protocol aimed at averting airborne collisions over Syria. Cook also confirmed Russian claims that its bombers had destroyed a large number of targets in Raqqa. Other U.S. officials were quoted as saying the Russian navy fired about 20 cruise missiles Tuesday from the Caspian Sea, striking targets in and near Raqqa. 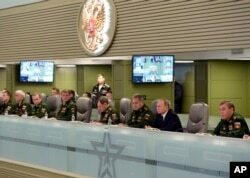 Russian President Vladimir Putin, second right, flanked by Defense Minister Sergei Shoigu, third right, and Chief of the General Staff of the Russian Armed Forces Valery Gerasimov, right, attends a meeting on Russian airspace forces' activities in Syria. France, enraged by last week's Islamic State massacre in Paris, also bombed the city of 220,000 near the Turkish border. French Defense Minister Jean Yves Le Drian, speaking late Tuesday, said 10 fighter jets were still bombing Raqqa, with 36 more warplanes able to launch strikes in the coming days. "I think these airstrikes will be very harsh for Daesh," he said, using another name for Islamic State. The Kremlin said Putin and French President Francois Hollande had agreed to "ensure closer contact and coordination" in their airstrikes. It also said Putin ordered an additional 37 warplanes into action and directed the Russian navy in the eastern Mediterranean to work "as allies" with its French counterparts. 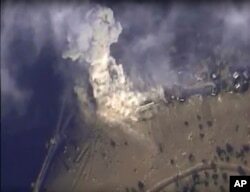 FILE - This photo made from footage taken from the Russian Defense Ministry official websiteNov. 2, 2015, shows a Russian airstrike hit a target in Syria. The question remains, can more firepower prevent future Islamic State attacks? Andrew Tabler of the Washington Institute for Near East Policy thinks the answer is no. “I think that France and a lot of other countries will step up their efforts, but you can’t bomb your way out of this problem,” said Tabler. Critics of the president’s strategy point to the attacks as a warning that the U.S. plan in Syria is not working. “There is no compelling reason to believe that anything we are doing will be sufficient to destroy ISIL,” said Senator John McCain. Tabler also recognized that there are no ground forces to be found who could attack ISIS in eastern Syria. “This president does not want to commit ground forces to Syria. Of course it begs the question, ‘What ground force is going to go into eastern Syria anytime soon and root out ISIS?’ And for the life of me, I can’t find one,” he said. But as the fight on the ground ramps up, the administration says local forces, not the Russians, French or Americans, must be the ones to push the terror group out of Syria. Moscow and Washington have sharply disagreed on strategy and tactics for bringing peace to Syria, where at least 250,000 people, most of them civilians, have been killed since civil war erupted more than four years ago. Russia, which launched its first Syrian airstrikes in September, has been accused by Western governments and military analysts of placing a much higher priority on preserving the government of longtime ally Bashar al-Assad than on the U.S. objective of targeting extremists. International efforts to bring about a diplomatic resolution to the Syrian crisis have seen renewed life in recent weeks, including several summits. Obama said Wednesday that Russia has been a "constructive partner" in working toward a political transition, and that their differences have prevented them from looking at how to create a cease-fire. Russia's Federal Security Service on Tuesday also announced a $50 million reward for information leading to the arrest of those responsible for the bombing of the airliner, which was brought down in the northern part of the Sinai Peninsula.